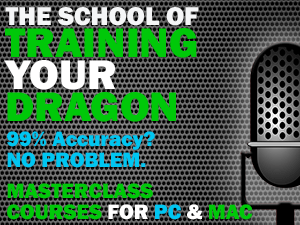 TRAINING YOUR DRAGON with SCOTT BAKER – Author of "The Writer's Guide to Training Your Dragon"
In a move that is likely to anger and dismay Mac users, Nuance has dropped a bombshell. Dragon Professional Individual 6 has been discontinued with immediate effect; there will be no updates to the existing software and no further versions produced. In other words, Dragon for Mac is dead. Via a press release, Nuance stated: “Dragon Professional Individual for Mac is being discontinued effective 10/22/2018 and will no longer be available for purchase…Customers who have purchased Dragon Professional Individual for Mac version 6 (“Software”) benefit from a perpetual license to the Software and may continue using the Software. Nuance will no longer provide updates for the Software after 10/22/2018”. While Dragon on the Mac platform has never been at the same level as the Windows software, things did seem to be improving. The release of version 6 was disastrous at launch – buggy, unstable and borderline unusable. But things improved dramatically and, with the last 6.0.8 update, it seemed like Mac users finally had a version of Dragon nearer in stability and features than ever to the PC equivalent. Despite this, Nuance has pulled the plug. All traces of the software have been removed from Nuance’s web site and it is no longer offered for sale. You can still buy it from the likes of Amazon and eBay but, with a very real prospect of it being disabled by an OS update and no hope of a fix, it wouldn’t be a wise way to spend your money. Obviously, this news brings huge ramifications for Mac users from both an accessibility and workflow standpoint. While the Windows software undoubtedly has a larger installed user base, the majority of writers I come across are using Macs. With no viable native solution (and no realistic competition), Mac users should consider using the Windows software via a virtual machine – something I have long advocated. Following the recent discontinuation of Dragon 13 Premium, Nuance has announced a new entry-level version of the product – Dragon Home 15. It’s available now for digital download directly from Nuance with a physical version shipping this month. At $150, it’s significantly cheaper than Professional Individual 15 – but there’s a catch. Much like previous Home versions, some features are crippled and, crucially, there’s no transcription functionality here. If, like me, you consider the ability to record audio for Dragon to turn into text later as essential, then this isn’t the version for you. On the other hand, for anyone who simply dictates at their computer and has no interest in transcription, this is a much cheaper way of accessing an up-to-date version of the product with the new Deep Learning speech engine. Due to the timing of this announcement (and the recent 15 Professional Individual upgrade offer), I’m now even more inclined to believe there will not be a v16 this year. Interestingly, there is no entry-level product for Mac users. They are stuck with Dragon Professional Individual 6 at an RRP of $300. “Dragon Premium is being discontinued. The company has been offering steep discounts on an upgrade to 15 Professional Individual to customers using 13 Premium via email or the built-in Update Manager. Interestingly, they mention the offer is valid until October 31, 2018 – it’s around this time of year that I would have expected a whole new version of Dragon to appear, so maybe they are holding off for another year. This could make sense, as version 15 is currently very stable and has recently received a welcome update. Nuance’s reference to “the new, simplified configuration of Dragon desktop solutions” signifies that the Dragon Professional Individual branding will remain consistent across both the PC and Mac products. This means the Dragon NaturallySpeaking name will finally bite the dust after 21 years – no bad thing, given the confusion the different names for these similar products can cause. This last week I got to say “G’day” to Aussie author, entrepreneur and all-round great person Melinda Hammond of Writer on the Road. NOTE: There are many visual references (including Melinda’s fascination with my office ‘Pop Vinyl’ collection!) during the interview that may seem confusing; I didn’t realise the podcast was audio only. My mistake! 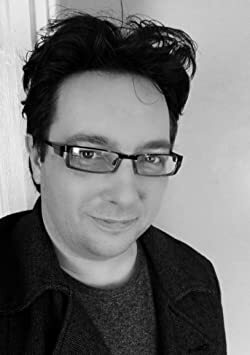 When I was first starting out in self-publishing, I didn’t know where to begin – I had been a freelance writer for some time and was caught up in the traditional publishing world, mainly working on magazines here in the UK. Luckily, I had The Creative Penn to guide me. 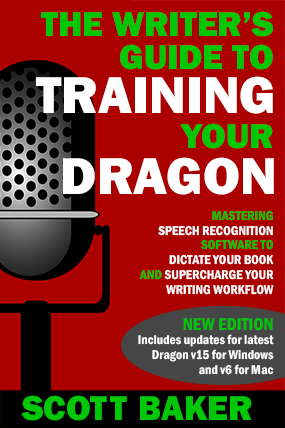 We cover some of the benefits of dictation including clear author voices; the health and mobility advantages of dictation; recommendations for equipment to use and tips for how to train your Dragon. I also talk about my upcoming School of Training Your Dragon, where you can go way beyond my books and delve deep into dictation via my new courses. A side note: A few months ago, I decided to purpose-build a dictation/writing office in my garden. To call it a “posh shed” would be a disservice – it’s a writer’s room, honest – and this interview took place on the day of completion. If you watch the video version below, you can see my choice of inspiration behind me – the two David’s, Bowie and Lynch, brilliantly interpreted by Rob Snow.